Arizona Sister Cities – Promoting peace through mutual respect, understanding and cooperation – one individual, one community at a time. Promoting peace through mutual respect, understanding and cooperation – one individual, one community at a time. To advise, assist and mentor current Arizona Sister Cities members; to expand current membership; and to work with all levels of Arizona government to promote the activities of our organization. To promote peace through mutual respect, understanding and cooperation – one individual, one community at a time. 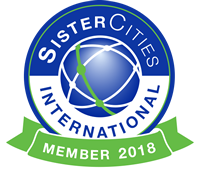 A Sister City program is a volunteer group of ordinary citizens who, with the support of their local elected officials, form long-term relationships with people and organizations in a city abroad. Each Sister City Program is independent and pursues the activities and thematic areas that are important to them and their community. In Arizona, these communities have Sister City partnerships throughout the globe. Sister City programs promote peace through people-to-people relationships — with program offerings varying greatly from basic cultural exchange programs to shared research and development projects between cities with relationships. Sister City Programs offer the flexibility to allow connections to form between communities that are mutually beneficial, and to take on issues that are relevant for the partners. Arizona Sister Cities is an important resource in the negotiations of governments in letting the people themselves give expression of their common desire for friendship, good­will and cooperation … for a better world for all.